SAN JOSE, Calif.--(BUSINESS WIRE)--Oct. 11, 2018-- Cypress Semiconductor Corp. (Nasdaq: CY), the embedded solutions leader, today announced it has embedded compute capabilities into its next-generation memory platform to address the growing demand for trusted intelligence and fail-safe storage in applications such as Advanced Driver Assistance Systems (ADAS) and smart factories. The platform includes standardized intellectual property (IP) that can be reconfigured quickly to address emerging applications. 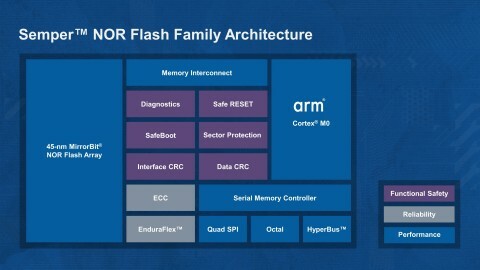 Cypress’ Semper™ NOR Flash family is based on the platform and is architected with an Arm® Cortex®-M0 processor to meet industry standards for building fail-safe embedded automotive systems and to provide reliable, high-endurance data retention at extreme operating temperatures common in automotive and industrial applications. Failure is not an option for mission-critical applications such as self-driving cars and factory equipment handling costly materials. For these applications to work every time, they require smarter system memory that is long-lasting, dependable and designed for functional safety compliance. Cypress’ Semper devices were designed to achieve the ISO 26262 functional safety standard using the Cortex-M0 processor to enable safe boot, processing of complex embedded algorithms, and functional safety diagnostics. The Semper family includes Cypress’ EnduraFlex™ architecture, which uses the Arm core to independently optimize the memory array for frequent data writing or for long data retention. The family also supports demanding instant-on applications with up to 400 MBps of read bandwidth. The Semper Flash family includes AEC-Q100 automotive-qualified devices with densities up to 4Gb and an extended temperature range of -40°C to +125°C. The EnduraFlex architecture simplifies system design by enabling a Semper Flash device to be divided into multiple partitions. For frequent data writes, a partition can be configured to deliver up to 2.56 million cycles for 1Gb parts, while for code and configuration storage, a partition can be configured to retain data for 25 years. More information on the Semper Flash family is available at http://www.cypress.com/semper-flash. Cypress is the leader in advanced embedded system solutions for the world’s most innovative automotive, industrial, smart home appliances, consumer electronics and medical products. Cypress’ microcontrollers, wireless and USB-based connectivity solutions, analog ICs and reliable, high-performance memories help engineers design differentiated products and get them to market first. Cypress is committed to providing customers with the best support and development resources on the planet enabling them to disrupt markets by creating new product categories in record time. To learn more, go to www.cypress.com. Cypress and the Cypress logo are registered trademarks and Semper and EnduraFlex are trademarks of Cypress Semiconductor Corp. All other trademarks are property of their owners.